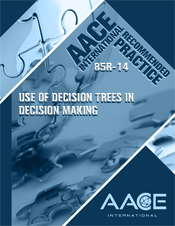 This recommended practice (RP) of AACE International defines the use of decision trees in evaluation of alternatives around project strategy in the presence of uncertainty and their potential implications. A large part of the risk management process involves looking into the future, trying to understand what might happen and determining whether it matters to an important decision we need to make. •	Distinguishing the costs or benefits of using a low-price bidder whn delivery time and quality are uncertain. •	The relative costs or benefits of adopting a state-of-the-art technology or staying with the proven technology. •	The relative attractiveness of building a greenfield plant or retrofitting an existing plant. Decision tree techniques involve determining the objective (e.g., maximizing profit, minimizing cost), specifying the objective (e.g., choosing among bids for the EPC contractor) and creating a decision tree that distinguishes between choices to be made (decision nodes) and potential consequences (chance nodes). The cost of taking a particular path to the end point (e.g., project completion) and the probabilities of specific uncertain outcomes are key data inputs into the decision and are applied to the decision tree model. •	Maximize utility based on the expected value of a linear function of monetary value, which is a hallmark of a risk-neutral organization. •	Maximize expected utility based on the expected value a non-linear function of monetary value, which is the appropriate measure of merit for a risk-averse or a risk-seeking organization.